Originally a NASA project, memory foam soon found its way into the medical industry and finally into the consumer world. Besides leaving cool imprints, a memory foam mattress has other perks. It conforms to your body’s shape and weight. This reduces pressure points. A drawback is often the expense. This article will help you find the best cheap memory foam mattresses on the market. Memory foam differs from traditional mattress foam in that it does not spring back. You instead feel the foam cells compress as they re-form. The foam cells have holes so air can be distributed to other cells. They are actually able to spread out the air pressure. The memory foam itself isn’t usually supportive, so it’s often a single layer atop another material. Perhaps the most obvious benefit of memory foam is pain relief, as these mattresses displace pressure along your body, reducing pain and soreness. Able to adjust to body heat, these products are temperature sensitive, contributing to comfort and pain relief in sore areas which tend to be a few degrees warmer. As the temperature gets higher, the material becomes softer. Memory foam mattresses also have the benefit of posturing. This allows for spinal alignment. You can, therefore, sleep better, not have a sore back in the morning, and perhaps avoid future spinal problems. During the night there is less motion, which will enable you to reduce your fidgeting and disturb your partner less. Memory foam is known to have various health benefits, including its ability to alleviate sleep apnea and snoring. The foam helps elevate the head during sleep, opening your airways. People have also seen relief from allergies. The polyurethane foam has inorganic fibers so dust mites cannot survive in them. What Are the Best Features to Look For? While memory foam has great benefits, there’s a lot to think about before you go into the store and buy a mattress. You need to know if it’s the right one for you. There’s also the issue of getting the best bargain for your money. The density is one of the biggest factors in cost and satisfaction. It determines the exact level of support provided by the memory foam mattress. If you don’t need a higher end 6 lb. density product, a cheaper mattress in the 2-3 lb. density range may do. Heat sensitivity will add comfort to the mattress. Once you settle in, the surface will get softer where there’s a higher temperature. The whole mattress responds to areas of warmer and cooler temperatures to help provide relief. Its foundation foam quality increases comfort as well. There’s usually a layer of urethane or other material under the memory foam. This properly distributes the mattress weight and affects the overall quality and service life of the product. Another feature to consider is memory foam toppers. You might only need a topper if you already have a quality mattress. These are sometimes below $100, but you should make sure the product matches the quality you need. There should be at least three inches of memory foam for proper cushioning. To find the right memory foam mattress see if the company is open to letting you test it. Some retailers allow this. They’ll cover the mattress in plastic to keep it hygienic. At the same time, you won’t have to worry about refunds or being stuck with the wrong product. Also, look into whether there was human-involvement in product testing. Read the details of the warranty including what your shipping/packaging/financial responsibilities are if you need one issued. Price is another factor to consider. You’ll often find better deals from distributors who sell directly to consumers online. They often sell higher quality mattresses at better prices than retailers. Search the web for slow recovery mattresses and especially sites that explain the features. A cheaper memory foam mattress may be more beneficial. Thicker varieties can have more compression, which can make it difficult for you to switch sides or otherwise move around. Many people opt for the softness of medium density foams. The best cheap memory foam mattress may, therefore, pay off in many ways. Rather than spending more on high density you save while purchasing a more comfortable product. Still having trouble finding an affordable, yet quality memory foam mattress? Here are a few examples that have been highly rated and will be much better for your wallet than competing products. You’ll rest well on this mattresses’ 2.5 inches of Air Flow Memory Foam and a 5.5-inch thick base. Full body support is the ultimate answer. In fact, the thickness and comfort level is ideal for just about anyone who wants to feel weightless. The product is designed to give a long, restful sleep for persons who weigh up to 400 pounds. Its materials are resilient and safe. Your body will be free of the effects of heavy metals, flame retardants, or formaldehyde. Such peace of mind will more readily produce sound sleep. You’re in luck with this mattress for many reasons. For one, the retailer claims it’s one of their bestselling memory foam mattresses. Second, you can clean the stretch knit cover any time, keeping your bed clean and fresh every night. Its resilient materials will inspire confidence from the time you open the packaging to when you lie down on the mattress. Sometimes you don't need to buy an entire mattress. That's where this three-inch-thick memory foam mattress pad topper comes in. This one adds a significant amount of comfort while covering up the saggy parts of your mattress and eliminating pressure points. Sleep more soundly and wake up feeling great. No harmful or toxic chemicals will spoil your sleep from this USA-made foam topper. The topper is a soft one, which is great if you long for that feeling. Once the new foam smell goes away, any sensitivity will be a distant memory. Just wait for it to decompress at the right temperature, and you can reap the benefits of one of the cheaper options on the market. This 13-inch thick mattress with a three-inch gel infused memory foam layer certainly gives you your money’s worth. Sleep blissfully on a one-inch comfort layer and two-inch ventilated airflow layer. An enhanced airflow, supported by the open-cell design, gives you that much needed full night of rest too. There’s also little motion transfer, so you won’t keep you awake. Also the support base is cooler than typical memory foam, so you can sleep soundly on the natural wool layer and bamboo fiber zipper cover. When you wake up free of back pain, you’ll realize this was the right investment. The wool will eliminate moisture, keeping you dry, and the washable cover will ensure you never go to bed to an unclean pillow. With this mattress, you’ll be free of harmful microbes, dust mites, or allergens. This is a bargain if you long for comfort, cleanliness, and relief from allergies and germs. A good sleep comes with peace of mind. This one-of-a-kind product is flame resistant and is without harmful compounds. It’s durable and long lasting and comes with a 25-year warranty. 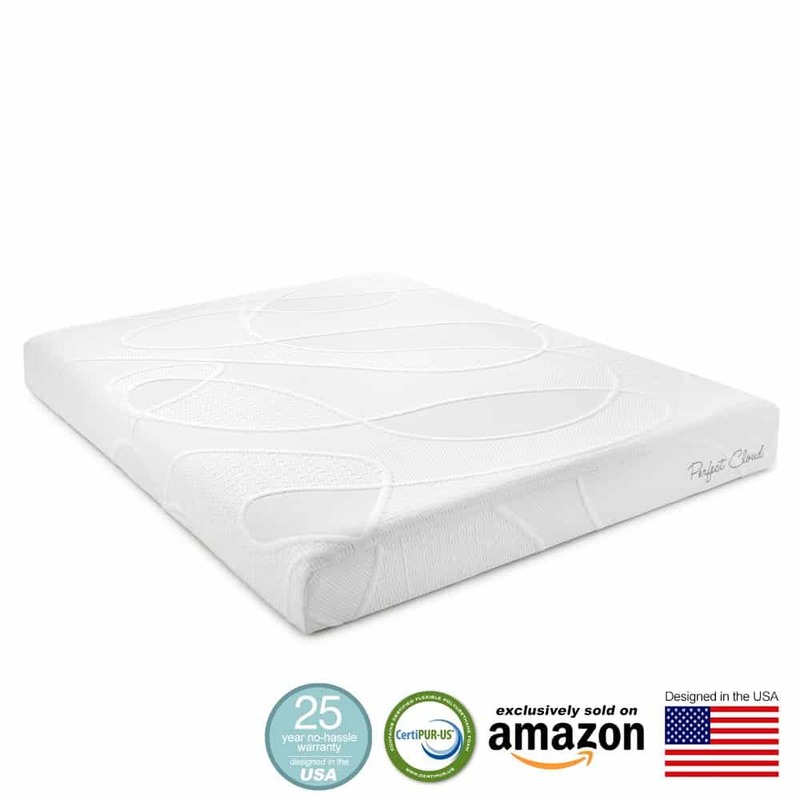 Sleep free of pressure points and discomfort on a layer of memory foam atop a layer of super soft foam. Your shoulders, hips, and other pressure points will be relieved thanks to a structured pressure relief system. This mattress is highly responsive to body temperature. It will automatically soften in sore areas and remains comfortably firm in normal temperatures. The result is a full night of sleep—comfortable and restful. You’ll feel renewed with one of the best cheap memory foam mattresses on the market. You should, however, test it first to ensure that it meets your needs and expectations. Stay fresh with the washable, zip-off cover. Enjoy the efficient service of a quick delivery. And take comfort in knowing that the mattress expands to its full size in just minutes. You get a bargain here for a full-sized mattress. Spinal alignment, pressure point relief, and a much-needed rest are a reality with the 2.5-inch memory foam comfort layer and an open cell construction. If you are going to bed and getting up with back pain, this mattress can help you get relief. All its materials have been proven safe. The mattress stays resilient after years of use, so you secure the peace of mind that comes with its reliability along with the sound sleep that it induces. What is the source of this comfort? A soft foam conforms to any body weight and position. Motion isolation lets you sleep deeply even when your partner is fidgety. Its soft velour cover resists allergens and dust mites. And you do not have to worry if your mattress is defective. The company is looks after you with its 25-year warranty. With the tips and reviews in this article, it should become less difficult to find the best cheap memory foam mattresses. There are indeed a few low cost, high-quality products. If you know how to find them, you will benefit from the support, pressure/pain relief, and comfort of memory foam.